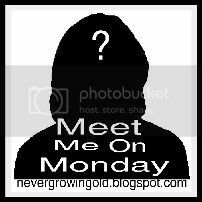 Never Growing Old: Meet Me On Monday to return!!!!! Since it is Easter, Meet Me On Monday will return next Sunday night!!! I can't wait!! I'm so excited to start this wonderful meme again!! I missed it too. I know that another blogger did start a new one in your absence. I am not sure who...?? Oh I didn't know that! No one asked so I'm surprised someone would do that!! so excited to get back to the meet me on Monday!!!! I am thrilled you are back!